The retail sales report from December was a disaster. Good news is this report was from December and we are already in February, so it’s very delayed. At this point, we already know all the retailers did and investors have utilized private estimates to understand the holiday season. Investors are now focused on the rest of 2019. We have no proof that there was a mistake in the data collection. But it’s interesting that during a shutdown the report wildly differed from private estimates. It also doesn’t make sense because the labor market is generating accelerated real wage growth. One other point which discounts this terrible report is that this holiday season was elongated. The extra week between Thanksgiving and Christmas helped boost sales in November at the behest of December. Black Friday was amazing. But December wasn’t as good according to some retailers. The report was bad every way you look at it. On a month over month basis headline retail sales growth was -1.2% which missed estimates for 0.1% growth. November reading was revised down from 0.2% growth to 0.1% growth. 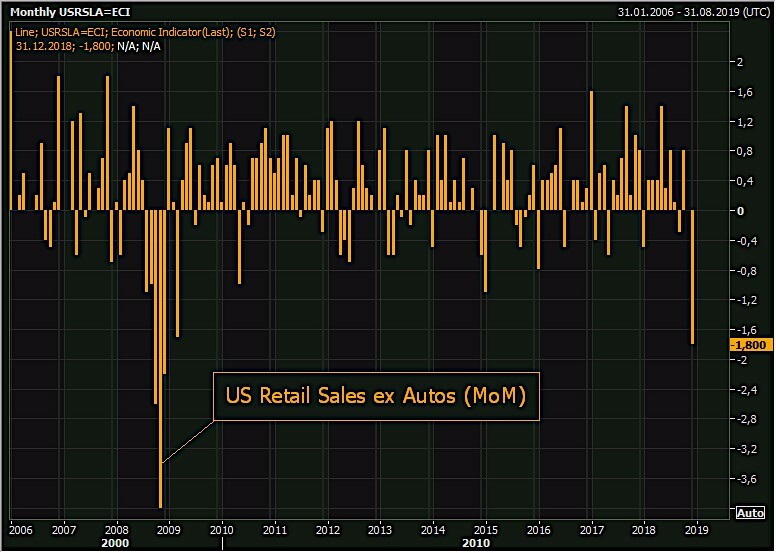 As you can see from the chart below, retail sales ex-autos were -1.8% month over month. This was the worst reading since September 2009. The consensus estimate was for no growth. The November reading was revised from 0.2% growth to no growth. Excluding autos and gas, sales fell 1.4% month over month which missed estimates for 0.4% growth. This was hurt by the decline in gas prices. The prior reading was 0.5% growth. Finally, the most important metric, which is the control group, saw sales fall 1.7% month over month. This was way below estimates for 0.4% growth and the prior report which had 1% growth. This report and the inventories report, which showed inventories fell 0.1% month over month instead of growing 0.2%, caused GDP estimates to crater.